The influence of freshwater inflows and salinity on spawning success of black bream Acanthopagrus butcheri (Sparidae) was investigated over 2 years in a small estuary on the east coast of Tasmania,Australia. The individual spawning seasons experienced quite different freshwater inflows; 2004�05 was characterized by low flows throughout the season whereas during 2005�06 there were three relatively large discharge events in the first part of the season. Macroscopic gonad staging of adults was used to define the spawning season and daily increment analysis of otoliths from recently settled recruits was used to backcalculate spawning dates. Gonad staging indicated that adults were in spawning condition over a 3 to 4 month period during spring and summer. 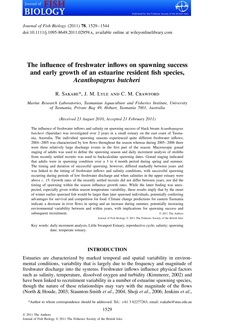 The timing and duration of successful spawning, however, differed markedly between years and was linked to the timing of freshwater inflows and salinity conditions, with successful spawning occurring during periods of low freshwater discharge and when salinities in the upper estuary were above c. 15. Growth rates of the recently settled recruits did not differ between years, nor did the timing of spawning within the season influence growth rates. While the latter finding was unexpected,especially given within season temperature variability, these results imply that by the onset of winter earlier spawned fish would be larger than later spawned individuals, potentially conferring advantages for survival and competition for food. Climate change predictions for eastern Tasmania indicate a decrease in river flows in spring and an increase during summer, potentially increasing environmental variability between and within years, with implications for spawning success and subsequent recruitment.